I needed one of these just the other day! My hands were laden with heavy grocery bags (reusable ones of course) and my five-year-old was just a bit too far away for comfort. I tried to get him to hold onto one of the shopping bags as we crossed the road, but really, there wasn’t much for him to grab on to. 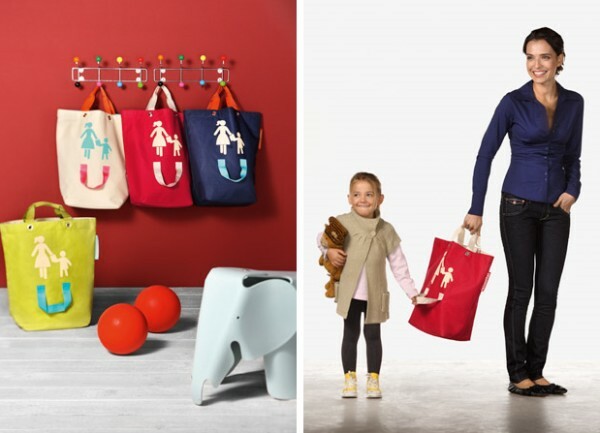 The Reisenthel Mother Child Bag solves this common problem with an astoundingly simple idea – a child-sized handle attached to the side of a shopping bag! It’s fabulous for times when you don’t have a hand to spare and offers your child a bit of security as well as extra safety while crossing the road. I’m completely sold on this idea and they’re available right now in red and lime from Peter’s of Kensington for $39 each plus post.